I was just about to write an email to my mentoring group and noticed myself thinking – “What will I write, I haven’t done anything?” And then I noticed that this, of course, wasn’t true. It’s impossible to do nothing at all . . . unless you’re dead! As long you’re living you’re doing breathing. And you must be somewhere in space so you are lying down or sitting down or standing or moving. So, if I don’t really mean, “I haven’t done anything” what exactly do I mean? This particular mentoring group consists of a number of coaches and what I was specifically thinking of when I said “I haven’t done anything” is “I have no new clients and haven’t done what I think I should do in order to change that”. When I joined the group I wasn’t sure if I wanted to take on any clients so having no clients was not a problem. But since then I’ve done some live coaching and found I and my “coachees” really enjoyed it. Now I have the idea that I would like to work with 3 people. As a result my measure of how I’m doing, relative to the group, is whether or not I’ve enrolled new clients. At first sight this seems a sensible measure but really it’s just as arbitrary as saying I’ve washed my hair 20 times since we last met or I’ve eaten 40 pieces of cake or I’ve pinned 53 quotes. In fact, the arbitrary stuff, whilst not necessarily being accurate as to quantity, is at least true as opposed to the patent falsehood that is: “I haven’t done anything”. I haven’t signed up any clients – true. I haven’t done anything towards signing up clients – one big porkie. I haven’t done anything – Laughingly untrue! So, let’s back track and, whilst keeping with the idea of returning to coaching, see what else I might say. I have added, in brackets, the thoughts that made me discount these things, first time round. I have done 4 live coaching hangouts which I thoroughly enjoyed and which were useful and insightful for the people being coached. (This doesn’t count because I intended to do this weekly and it seems to have dried up). I have written half a sales page with the thought that I need somewhere to send people who don’t know me and want to sign up. (This doesn’t count because it’s only half written and I’m not even sure I should be writing a sales page anyway). I have been experimenting with my Pinterest account to see if I can reach people that way. (This doesn’t count because it’s a distraction from what you should be doing as it’s related to my art and not my coaching). Feeling fed up with myself for faffing around I recorded a live hangout the gist of which was “I’m looking for 3 clients are you one of them”? You can view it here: Slightly bonkers Coach seeks 3 “I’m up for it” clients for a spot of Flow Coaching. (Doesn’t count as I didn’t promote it anywhere so the chances of anyone seeing it are slim to none). I’ve done some work on 4 paintings for my Inspirational Quotes selection. (Doesn’t count as they’re not finished and they’re not part of a well thought out strategy related to practice building). “I’m not doing anything” and it’s siblings “I’m not doing enough”, “I’m not doing the right things” are big thought traps I frequently get caught up in. I don’t like the feelings such thoughts cause and, in order to change those feelings I often fall back on trying to do the right thing or what I think I should be doing. Such actions just feed the thoughts. Conversely, when I notice the invalidity of such thoughts I slip back into simply doing the next thing, guided by feeling, and when I do that, life flows. So , , , I have 2 questions for you . . .
1. 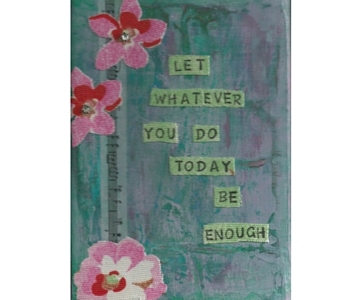 Are you willing to let whatever you do today be enough? 2. Do you know anyone who might be one of the 3 clients I’m looking for? If so, please ask them to contact me – gjpcoach at gmail dot com. Ta, very much and thanks for reading. I appreciate it! Loved this post so much. I really needed to open up my eyes, as I “have done nothing” today – I realize the obvious lie, so thanks! Thanks so much for taking the time to comment. Glad it helped you catch yourself out! My goal for yesterday was to do nothing. It was a day off from work and my plan was to avoid doing anything of any consequence and I achieved my goal, I felt suitably rested when I got back into the workflow today and got lots done. Of course, I actually did ‘stuff’ on my day off but it was all inspired by not doing anything goal! Glad you enjoyed your doing “nothing” day Sarah. Thanks for your comment. That’s great to hear Charlotte. Thanks for your comment. And… I am interested in joining you for an in the flow coaching session. Hi Gillian. Just watched your wonderfully wacky and extremely honest and open “I need 3 people” video. If it isn’t too late, I think I might be 1. Feel free to email me back. Thank you for directing me to your wonderful post, I always like reading different perspectives on the same subject. I like that quote a lot, if you don’t mind I think I need to embroider it some where. Thanks for visiting my blog Giova. Please feel to embroider the quote but, if you do, please post another comment with a link (if you put it online). I’d love to see what you do with it. I’m a big fan of sewing and textiles although it’s not something I do myself so I love looking at other’s work!